"From the darkest pits of your blackest nightmares...oh wait, that's another listing. 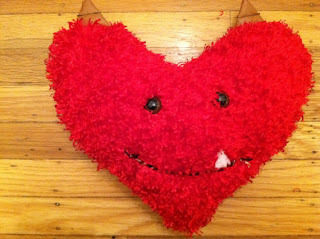 This is a Love Monster. He loves you. It seems self explanatory. He is a medium-sized, about 12" across, fluffy heart that beats only for you, or anyone lucky enough to own him. Legends say that if he is loved enough, he may one day be able to grow a second tooth. He yearns for this day. Will you give him the love he needs?"